LINQ has the capabilities of providing a great productivity boost. LINQ Chaining is particularly powerful magic, giving your code greater clarity and brevity. Using it, and debugging it, can be tricky without the right tools and techniques, but Michael is on hand to explain and make suggestions. Exactly six years later almost all the information in this article is still good–not an easy feat with the pace of software change! But now there is more to say, so I have written a sequel to this article expounding upon the capabilities of a powerful new LINQ debugging extension for Visual Studio. You might want to continue reading this article first though, to get a good grounding (you know, walk before you can run). Then go read LINQ Debugging and Visualization. This article is for .NET developers who have not used LINQ, LINQ users who have not used LINQPad, and LINQPad users who have not used LINQPad Visualizer. (Some familiarity with LINQ is assumed though.) I take you beyond the basic concept of a LINQ query and reveal the simple techniques for creating LINQ chains, softly introducing the notion with analogous ideas in Unix and in .NET programming in general. As soon as you think about chaining, though, you have to be concerned about how to keep the “stuff” in the middle accessible, to keep it from becoming an opaque black box. I show you how to do this both in Visual Studio with a simple extension method and in LINQPad with its powerful Dump method. The accompanying code archive lets you experiment with everything discussed as you read along. 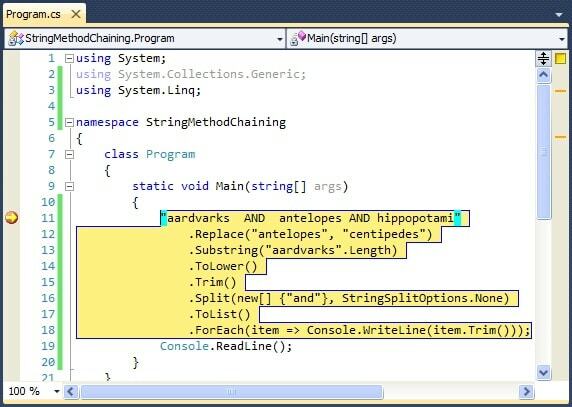 "aardvarks AND antelopes AND hippopotami"
Note that you could write the same code without chaining, by introducing a slew of temporary variables. This code does the same thing but takes significantly more effort to comprehend. The previous code you could likely understand almost with a glance. Here, you have to stare at it for a bit. So is method chaining always better? Actually, no. If you want to debug this code and view an intermediate value, you cannot do it with pure method chaining. If you set a breakpoint and then execute, Figure 1 shows what you see when you land on the breakpoint. The entire chain is considered an indivisible unit! That is because, well, it is. Remember that Visual Studio breaks on statements and any single method in the chain is not a statement in and of itself. From this breakpoint if you use the step over command, you advance to line 19, the Console.ReadLine. However, if you instead use the step into command, you advance to the Console.WriteLine on line 18, because though deeply embedded, Console.WriteLine is a full-fledged statement. Unfortunately, if you need to see any intermediate value other than item in that line, you have to rewrite the code to introduce separate statements with temporary variables. The principled, high-minded designer in you is, I am sure, repulsed by such an unsatisfactory kludge. Fear not, for there is a better way. 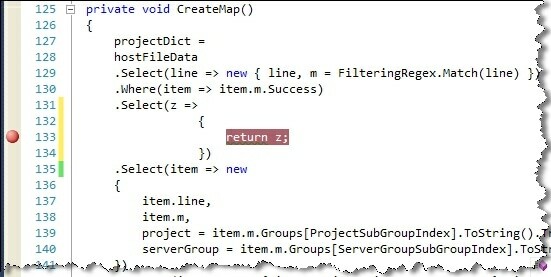 But first, take a look at method chaining as it applies to LINQ. Even articles discussing more advanced LINQ methods typically exhibit a simple example, which is fine and necessary, but almost always stop after proclaiming that you conclude your LINQ expression with a Select or GroupBy. Even the useful and venerable 101 LINQ Samples page from Microsoft shows only the simplest examples, yielding no clue about method chaining. LINQ Queries may appear in one of two forms; the query above is written using query syntax. The next example uses method syntax (also called lambda syntax). The two forms are exactly equivalent (where they overlap), and performance is also exactly the same because, during compilation, query syntax expressions are converted to lambda syntax internally. However, the lambda syntax is richer, particularly in C#. Therefore, LINQ naturally lends itself to method chaining! 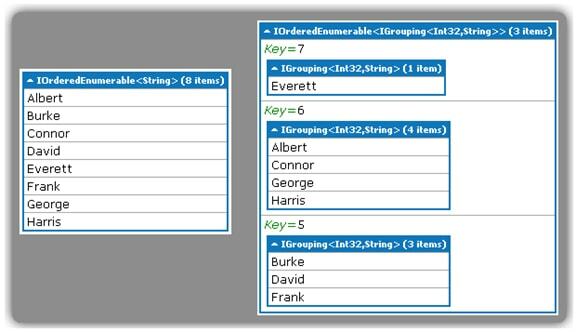 Kris Thompson’s blog contains a great reference of LINQ operators, identifying the return values of each so you can see at a glance which ones lend themselves to LINQ chaining. Many of them-with IEnumerable<T> as both input and output-may be used at any position in a chain. But since all (?almost all) LINQ operators use IEnumerable<T> as input, all of them may be used at the end of the chain. The final point here is that LINQ method chaining is different than normal method chaining with respect to stepping in the debugger. Though the entire chain is marked with a single breakpoint, once you reach the breakpoint you can step through a LINQ query. Figure 2 shows the scenario after having pressed the step over button a number of times. At that point, you can inspect local variables as on any breakpoint with the Immediate window, tooltips, etc. It is not that the methods are special in any sense as compared to the string methods you saw earlier. Rather, it is the method arguments that are different. A LINQ method typically takes a lambda expression, which is an anonymous function composed of expressions and statements. Thus, you may step onto these statements with the debugger as well. Actually setting breakpoints on parts of the LINQ chain, however, is quirky. If you use the shortcut key (F9) pressing it once sets a breakpoint on the entire chain. Pressing it again, removes it. Repeat ad infinitum. If, instead you use the mouse to set a breakpoint by clicking on the grey channel at the left edge of the window the first click will perform the same (setting a breakpoint on the entire chain) independent of which line in the chain your mouse is adjacent to. I find, though, that if I stubbornly click in the channel adjacent to different lines within the chain I can sometimes get a breakpoint to stick. Thus far you have seen how attempts at debugging method chains are useful to a degree, but still unsatisfactory. The next section shows you some powerful remedies. The other crucial factor is that the statement must be accessible to the debugger, i.e. it must be on a line by itself. Then you can set a reliable breakpoint, as shown in Figure 3. The input is this word list, which includes some different casings, some extraneous spaces, and is unordered. The output of the program is shown in Figure 4, left side. You can distinguish the program output from the diagnostic output in yellow but it is impossible to distinguish the multiple occurrences in yellow. By specifying non-default arguments to Dump you can enhance the output. The final version of ProcessWordList below uses the same Dump extension method but this time supplies two arguments, one to label the step and one to colorize the step. This method yields the output in Figure 4, right side. The labeled/color-coded output clearly communicates what step generates each line of output. It also reveals that LINQ really is a pipeline! Observe that the first word goes through the first 4 LINQ methods before the second word is even touched. The second word only survives the first 3 methods because it fails to make it through the filter looking for words starting with “k”. After all five words are processed by the first four steps, the remaining list-now just 2 words-is processed by the OrderBy method. OrderBy processes the whole list as a unit so it knows to wait for all the previous steps in the chain to complete. Notice that after OrderBy the data again flows in a pipeline from the final Dump call to the main program, which does a plain Console.WriteLine, because the blue Dump output is interleaved with the white standard output. This injection technique is more powerful than the simple, inline approach given earlier. You could achieve a similar result by setting a breakpoint inside the Dump method, then manually examining values in the debugger. But this technique is particularly useful if you want to see a stream of output from a running program rather than stop at a breakpoint. It is also handy because you can compile in your injections and get diagnostic output without having to run inside Visual Studio. Also, by modifying the Dump method you can change your destination from the console to a log file for further analysis and post-processing. Finally, I encourage you to review DeSmet’s blog entry where he discusses further ways to extend the Dump / Watch method. 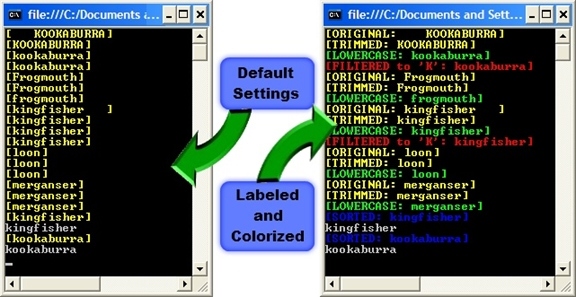 The Dump method is transparent to LINQ: its input passes through unchanged. You can instrument any step(s) in the LINQ chain you want to watch. You can observe the pipelining to debug interactions. You can dump simple values or complex objects because the Dump method lets you specify an arbitrary lambda expression. You can output derived values: for example, show not just each word but also its length-see the ProcessWordList4 method in the accompanying LinqMethodChaining project. Optional color coding and labeling let you clarify your output. To color code without labeling, use an identity lambda expression (x => x). The techniques presented thus far give you useful and flexible capabilities for examining simple data. But when you want to examine complex objects you need the power of Joseph Albahari’s LINQPad. LINQPad is one of those rare applications that is elegant, powerful, and well-designed. As soon as you start using it you know it is “just right”. Remember back when you discovered the awesome power of Visual Studio; LINQPad is like that, too. (I have no affiliation with the application or its author. 🙂 LINQPad is a sandbox/IDE for .NET languages (C#, VB, SQL, F#) that lets you develop code without all the overhead of creating solutions and projects required in Visual Studio. I use it primarily for C# work though I have read some intriguing articles recently that some people use it to completely replace SQL Server Management Studio! In the C# arena, LINQPad appears as if it converts C# from a compiled language to an interpreted language. You can just type in an expression and press Execute (F5). Change the language selector from C# Expression to C# Statements if you want to put a bit more code on the page, or to C# Program for full class support. So you can define classes if you need them but if you just want to try out a few isolated statements you can do that in an instant. Append .Dump( ) or .Dump(“your title string“) to the end of something you want to examine. That is it. Period. Honest. The remainder of this article just shows you some tips on how to gain the most leverage from that method call. As an introduction, I start with an illustration of two examples, borrowed from my previous article Using Three Flavors of LINQ to Populate a TreeView. This query effectively creates a two-level structure. The select clause-the final clause in the LINQ query-defines the top level (the lengthGroups). Working backwards through the query, at the second level, the lengthGroup elements are sorted by the length of each collected group in descending order. This second level (defined by the group…by) fills each lengthGroup with individual names, and the names within each lengthGroup are sorted in ascending order (the default on the first orderby clause). Dumping the output of a query is certainly useful. But it becomes significantly better still if you can peek inside the LINQ chain, just as you saw earlier with the ProcessWordList2 and ProcessWordList3 methods. 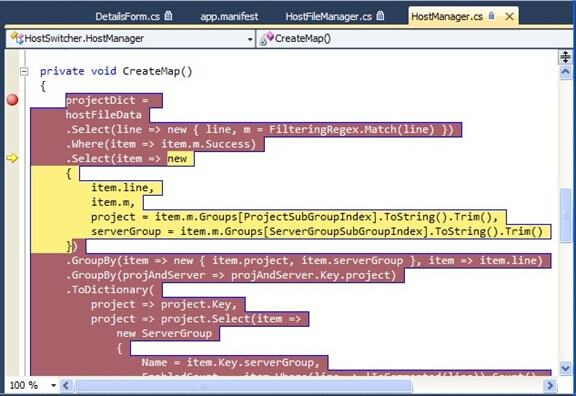 Recall that those used a custom Dump method in Visual Studio that was specifically designed as a pass-through method. I have not seen it documented anywhere, but I thought that the LINQPad Dump method must surely be as well-designed as that, too! Here is the bird example shown earlier tailored for LINQPad. Paste this code fragment into a LINQPad buffer, set the language to C# Statements, and execute it. Figure 6 displays the result: a series of lists presented in a way that is instantly comprehensible. You see each step of the LINQ chain and can watch as each transformation occurs. The LINQPad Dump method is indeed transparent, returning its input unchanged to the next step in the chain! This Dump method has a different signature than the custom Dump method presented earlier for Visual Studio use. The earlier one had two signatures: one with no arguments and one with two arguments, an IEnumerable<T> and a ConsoleColor. This one also has two signatures: one with no arguments and one with a single string. For the latter, the string is used as a title on the list block that follows. Another difference to note is that this Dump method shows all the results from one step, then all the results from the next step, etc. The earlier Dump method showed individual results from one step intermingled with those of other steps, and let you see the actual sequence of execution. LINQPad is not changing the way the LINQ chain executes here; rather, I assume it is just collecting all the results internally and repackaging them in a clean visualization before presenting them. The HostSwitcher subset.linq file in the accompanying code archive contains an excerpt of the HostSwitcher code, including the CreateMap method shown near the beginning of this article. This real-world example lets you experiment with complex objects in LINQPad. Open the file in LINQPad and execute it and you get the dump of two structures (Figure 7). This method starts with the ToolStripItemCollection of the contextMenuStrip. Recall, however, that LINQ has great affinity for IEnumerable<T> objects. The Cast extension method converts the ToolStripItemCollection to the more palatable IEnumerable <ToolStripItem> for further processing. The Select method enumerates all the items in the context menu, with the label in the first output column and the contents in the second. 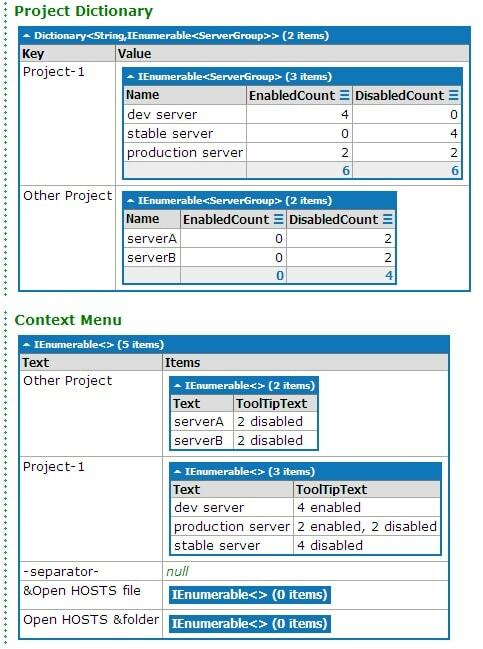 The contents are generated by a nested LINQ query that extracts the label and the tooltip from each second-level menu item. After the first Select method, the data is projected into records with two fields. All inputs records are included because this point occurs before any filtering-notice the count of 26 records indicated at the top of the output. Here the output is filtered to include only those records with successful regular expression matches; the count is down to 16 records. The data is reformatted again to project into records with three fields that will be used in subsequent steps; there are still 16 records at this point. The first GroupBy reorganizes the data to 5 records grouped by project and server group. The second GroupBy then nests those groups in a parent grouping of just projects. This grouping arrangement then allows applying the ToDictionary method to get the final dictionary required. As I was developing HostSwitcher’s CreateMap method in Visual Studio, I lamented that I could not see the data structures the way LINQPad could show them to me. So I copied most of my code into a new LINQPad file, added the appropriate references, and then worked on the method in LINQPad, copying it back to Visual Studio when I completed it. Unfortunately, there is no automatic way to copy a Visual Studio project into LINQPad. I asked the author Joseph Albahari about importing a Visual Studio project into LINQPad in this StackOverflow post; while LINQPad does not do this, he is now thinking about at least adding a way to import references from a Visual Studio project. And, more immediately interesting, he pointed me to a Visual Studio add-in called LINQPad Visualizer by Robert Ivanc. With Ivanc’s visualizer, you can get LINQPad’s Dump output inside Visual Studio! To do this, you need to set up a watch expression while you are debugging your code. But before you do that you need to install the add-in to Visual Studio. This is a two-step process. Be aware, however, that at the time of writing LINQPad Visualizer does not support Visual Studio 2010 yet, though Ivanc has assured me it is on his “to do” list. 2010.12.04 Breaking news: Just hours ago Robert Ivanc released a version that supports VS2010! From the link above, obtain the linqpadvisualizer.dll and, as Robert indicates in his instructions, copy the dll to the Visualizers folder of your Visual Studio instance (e.g. 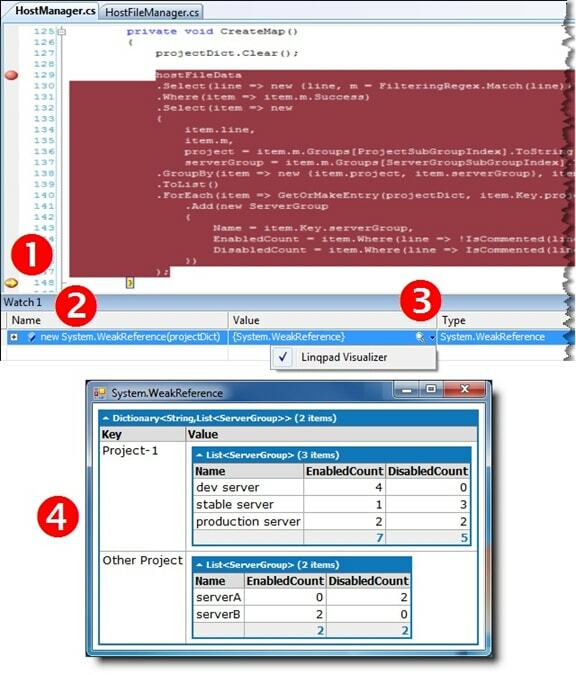 Documents\Visual Studio 2008\Visualizers). If the Visualizers folder does not exist, just create one. Copy the LINQPad executable (LINQPad.exe) into the same Visualizers folder. Also copy it to the same folder where Visual Studio’s devenv.exe executable resides (e.g. C:\Program Files (x86)\Microsoft Visual Studio 9.0\Common7\IDE). Another important point here: LINQPad is available for both .NET 3.5 and .NET 4.0. You can actually run both on your system without conflict. For LINQPad Visualizer, though, you must use the version for .NET 3.5 (which is LINQPad version 2.x ! ). Because of the restriction of LINQPad Visualizer to Visual Studio 2008, the accompanying code archive includes a VS2008 version of the HostSwitcher solution so you can try out the code as you read on. Upon pressing return in the Name column of the watch window, you should see the WeakReference show up in the Value column with-and this is the important point-a dropdown indicator on the right edge of the Value field (point 3). Open that dropdown and select (probably) the only visualizer available, the Linqpad (sic) Visualizer. Upon making that selection, you should get a new pop-up window showing the output of the variable you specified in the same form as LINQPad’s Dump method would render it (point 4). My example shows the dictionary created by the CreateMap method, exactly as you saw it in Figure 7. As already mentioned it does not yet provide Visual Studio 2010 support. If you leave the watch definition in place, the next time you debug the project and open the watch window the value field says “This expression causes side effects and will not be evaluated.” At the right edge instead of a dropdown icon you will find a refresh icon. Simply click that refresh icon to restore the dropdown. Most significantly, LINQPad Visualizer can only inspect objects that are marked as Serializable. (Ivanc clearly mentions this as a limitation on his web site, so kudos to him for that.) Unfortunately, I still had a bit of trouble with the dictionary example I have been using. If you look carefully in Figure 9 you will observe that the code for CreateMap is somewhat different than the code listing I originally presented for the method. To demonstrate LINQPad Visualizer I had to revert to this earlier version of the method. The more streamlined code (using the ToDictionary LINQ method) causes LINQPad Visualizer to throw an exception complaining that the new ServerGroup() construct is a non-serializable type even though it does have the [Serializable] attribute. I point out the defects I have found not to condemn the product, but rather to help you work through them. I commend Ivanc on his efforts and look forward to improvements with this handy utility. LINQ is a tremendous productivity boost when you understand its capabilities. Fortunately, it is a technology that you can learn a bit at a time and also apply a bit at a time; it does not require nor demand wholesale conversion from previous techniques. Use the Dump method presented here to prevent your LINQ chains from becoming opaque as you delve into more and more complex chains. As you are learning LINQ, LINQPad is invaluable, letting you experiment with code fragments with ease. But it is not just a tool for learning; it is great for “real-world” code development in general. When you need to work out some data flow, copy pieces over to LINQPad so you can developer and/or fine-tune it. Alternately, if it is cumbersome to find all the tendrils of the code you are working with to move it to LINQPad, bring LINQPad into Visual Studio with the handy LINQPad Visualizer, subject to the caveats mentioned. If you have not yet experienced LINQ, now is the time to give it a try! The code archive accompanying this article includes: a VS 2010 solution (ChainingAndDebugging) illustrating dumping in Visual Studio; a VS 2008 solution (HostSwitcher2008) illustrating the LINQPad Visualizer; and a LINQPad Queries folder with LINQPad examples. Impedance matching is a design practice in electrical engineering (used here as an analogy) whereby the output of one stage is designed to most efficiently and effectively match the input requirement of a subsequent stage in a pipeline process. 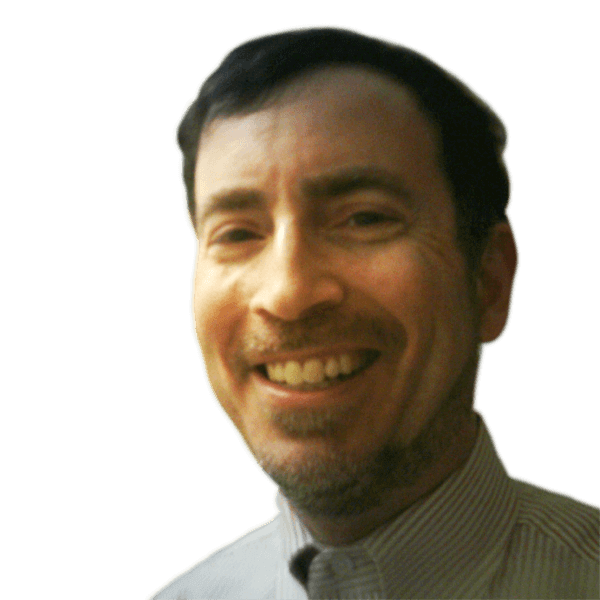 LINQ comes in several main flavors-LINQ to SQL, LINQ to XML, LINQ to DataSet, and LINQ to Objects-and a whole variety of lesser known ones, too. This article focuses on LINQ to Objects but the principles apply to LINQ in general. See my earlier article Using LINQ Lambda Expressions to Design Customizable Generic Components for more on query syntax vs. method syntax. 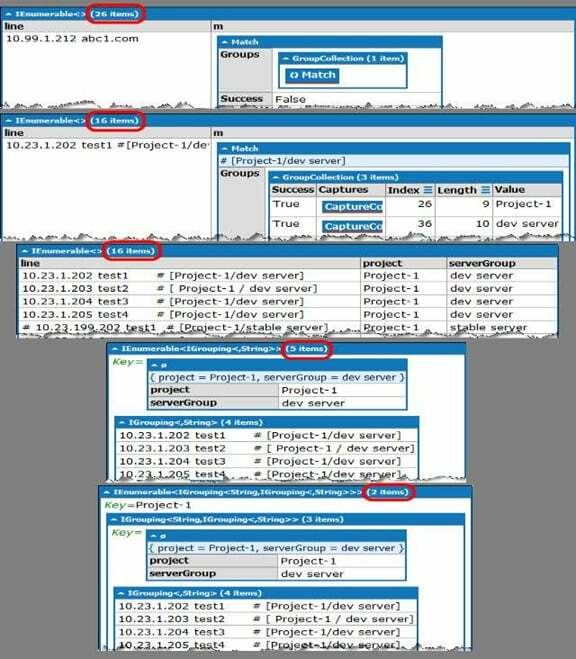 For further reference on LINQ operators, see the MSDN reference pages Enumerable Methods and Standard Query Operators Overview. The latest version of the visualizer now also supports objects that are not marked with [Serializable] to be viewed. If you want to set a breakpoint on a lambda, position the caret within the expression part of it (not the parameter(s)) and press F9. You can have multiple breakpoints on a single line of source if it has multiple lambdas there is no need to turn it into a statement block. Method chaining is generally to be avoided. The first example given in this article is what should have the principled designer in every software developer screaming for mercy. The example with s1, s2, etc. is bad because it is deliberately written to be so. There are several meaningful intermediate values which should be separated out, just not by the awful practice of meaningless variable names. In real-world examples, the methods being executed are executed for particular reasons which should give hints as to what variables should be called. Contrary to your claim that the chained methods are easier to read, they actually make the code far more obscure. After a couple of chained methods it’s difficult to know what is now being acted on by the subsequent methods. And knowing what the code is doing should certainly be high on the list of priorities when writing the code. Otherwise someone having to maintain the code has to waste precious time untangling the mess created by the original or previous author. Unless what the chain does is immediately obvious (such as .Trim().ToLower()), chaining should be avoided unless the goal is to produce code that is difficult to maintain for the sake of expediency of the current developer.